The driving force behind several buzzed-about networks, Devlin Hayes is considered to be a wunderkind in the television industry. Although his plans to rebrand CuisineTV and make Serving Romance more Millennial-friendly don’t thrill Cecily, her charming, blue-eyed boss is a hard man to say “no” to and she really wants to keep her job—even if that means sharing screen time with a loathsome blast from her past. Mercurial Italian chef Dante Marchetti a.k.a. “Il Duce” was once Cecily’s boss, and she has the PTSD to prove it. Now the owner of one of the hottest restaurants in town, Dante’s egomania knows no bounds and his constant attempts to provoke and upstage Cecily make her want to conk him on the head with a sauté pan. She thinks they’re toxic together, but viewers love their chemistry and clamor for more. It took me a little while to get into Mixing It Up as I didn't instantly warm to the main character of Cecily Sinclair, but there are so many other colourful characters that it wasn't long before I found that I was really enjoying it. Cecily doesn't really need to work as her family are super-rich, but Cecily has a passion and flair for cooking; something her Grandmother looks down her nose at. 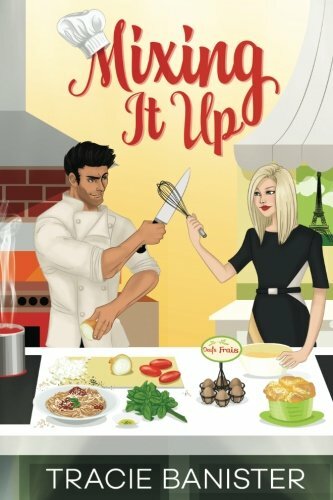 Cecily is the star of a TV cooking show, Serving Romance, but when a new CEO joins the station he brings new ideas with him. It isn't long before Cecily is forced to share the stage with guest chefs and that's not a problem at all until one of the guests is her ex-boss, Dante Marchetti. Dante was Cecily's boss when she was training and he'd leave her quivering in fear like a jelly if her dishes didn't come up to his satisfaction. Now Cecily is the star, will Dante cope with taking orders from her? There is so much friction between Cecily and Dante that they become an overnight sensation and the station decides to make Dante a more permanent feature so a new show is born: Mixing It Up. With such a fine line between love and hate, tempers flare and passions soar between Cecily and Dante. There are some great scenes between the pair of them, and Dante often had me in kinks of laughter with his naughty Italian humour. Putting the cooking show to one side for a moment, I have to say that I loved Cecily's crazy family particularly her quirky cousin, Dina. Dina is certainly a free spirit and isn't afraid to raise her grandmother's eyebrows - in fact with both Dina and Cecily refusing to conform to their privileged upbringing, granny Bernadine's eyebrows must be permanently raised. Mixing It Up is difficult to read without your tummy rumbling and your mouth watering as each dish is described in delicious detail. I really wish it had been a scratch and sniff book to see if the delectable cooking aromas I was imagining matched up to real life. Anyone who loves The Great British Bake Off and other popular TV cookery shows, will love this book - it almost made me want to reach for my apron and whip something up in the kitchen...almost!